April 25, 2018 – Volunteers are needed to plant dozens of trees at the H. Smith Richardson Wildlife Preserve during two workdays this weekend. 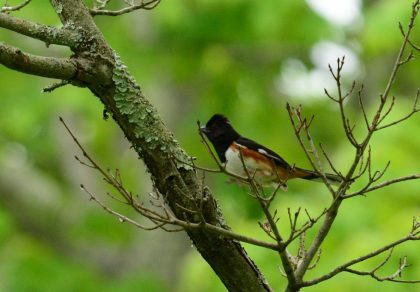 On Saturday and Sunday, April 28, and 29, the Connecticut Audubon Society will gather a group at the Westport preserve from 10 a.m. to 4 p.m. to plant more than 100 native trees and shrubs in pre-dug holes as part of the ongoing restoration of the property. The new trees and shrubs will improve habitat for nesting, migrating and wintering birds. Bring a shovel and gloves and join over 65 volunteers for a great day for bird conservation! We’ll provide the snacks and drinks. Call Milan Bull, our senior director of science and conservation, for more information, (203) 610-5097. The preserve is on Sasco Creek Road. This link will show you the location. The work days are part of a continuing project to transform a weed-choked 36-acre section of Smith Richardson Preserve into a thriving sanctuary for birds, pollinators, and native plants. Over the next several years, a total of 1,200 trees and shrubs chosen for their value to birds and other wildlife will be planted. The project also includes creating a two-acre pollinator meadow of native wildflowers. As the restoration continues at the meadow, conifers and native hollies will be planted in clusters to provide cover for the Saw-whet, Barred and Great Horned Owls from which the sanctuary is known. The sanctuary’s soils may also be able to support an Atlantic White Cedar Swamp, one of the region’s rarest habitats. The H. Smith Richardson preserve consists of three sections, all on Sasco Creek Road in Greens Farm. In addition to the 36 acres now being restored, the preserve includes a 24-acre Christmas Tree Farm, and 12 acres that Connecticut Audubon recently restored into a meadow. The restored meadow is now home to Eastern Bluebirds, Tree Swallows and Eastern Kingbirds. Bobolinks – one of the state’s rarest grassland birds – have even stopped by during migration. Restoration of the 36-acre parcel is funded by a Long Island Sound Futures Fund grant, along with individual donations.